On Friday I woke up with the distinct feeling that I was going to fall over. There was dizziness and light-headedness and no ability to discern if these two things were, in fact, the same. So I did what any self-respecting lady would do. I took the day off and spent the afternoon Internet shopping. I mean, that’s how you’re supposed to spend a sick day, right? However, one of the side effects of this job is how easily simple activities turn into case studies for how things could have been done better. Spend a few minutes on the Web attempting to shop and you can’t help but notice that many common sense eCommerce marketing practices are not as common sense as you thought. And then, instead of watching re-turns of The OC on the Soap Network, you’re penning blog posts in your head about how eCommerce sites can tighten up their checkout processes to dramatically increase conversations. Because that’s how sad my life is. There is a certain state of euphoria that overtakes someone when they make the decision to add something to their shopping cart. They’re excited, their heart is racing, and they’re completely ignoring the fact that in three minutes they’re going to wonder if they really need that giant owl locket. This is the moment where you want to convert them and it’s why displaying a “check out now!” button as soon as an item has been added to their cart is a very good idea. Maybe they’re not done shopping and will keep browsing, but if they are then you want to get them to that checkout BEFORE the self-doubt creeps in and makes them second guess their purchase. I don’t want to brag or anything but I am THE Queen of Abandoning Full Shopping Carts. I fill up my cart with everything I want to buy, I get excited…and then I roll that shopping cart (or “wagon”, as us Long Islanders call it) to the trash can and quickly run away. It’s your job to not let me do that. If someone is trying to leave your site with items left in their shopping cart, consider hitting them with a pop up or another notification asking them if they really, really want to make a thousand puppies cry by doing that. Sure, we all hate popups, but never underestimate your ability to use that hatred (combined with a mother-sized guilt trip) to your advantage. When I’m checking out, I want to know how long this is going to take. Tell me if I’m on Step 1 of 3 or if I’m on Step 3 of 7. This lets me feel like I’m moving along, that there’s an end in sight and that I won’t be stuck on your Web site forever. And if there’s a reason you’re NOT telling me this, like maybe you’re trying to hide your 20-step check out process, then that’s something you should fix. Because the Internet took a vote and it hates you. HEY YOU! Stop. Slowing down. The checkout process. Just because you want people to create an account on your site so that you can better market to them does not mean you should throw this hurdle in their way while customers are trying to finish a purchase. Whether you realize it or a not, to a credit card-wheeling customers the “create an account” option screams THIS IS GOING TO TAKE FOREVER! And it makes them want to go away. I know this because I often leave sites that require me to register (I do the same for blogs that require the same to comment, BTW). Let people checkout as a guest. If they love you that much (and if you provide a compelling reason to do so), they’ll create an account later. This is the not where you want to annoy them. If I’m making a purchase while logged into your Web site (aHA! You got what you wanted! ), then you already know certain information about me. You know my name, you know my email address, heck, you may even know my address. If this is the case, then why are you making me type that information in again when I go to checkout? The more stuff you make me do between “OMG, I WANT THAT” and “OMG, I GOT THAT!” the less likely it is I’m going to see that last step. Or that you’re going to get my money. Once I am in the checkout process, every question you ask or piece of information you collect should be 100 percent related to this purchase. Otherwise, you are distracting me from my goal and making it less likely that you will ever see my credit card information. Don’t be a dummy. Similar to above – once I’m in the checkout process, buttons and links to do ANYTHING else on your site should be removed. Once I’m there, encourage me to stay there, to finish the process, and to be giddy about those over-priced shoes I just purchased. Because if I have the choice of giving you my credit card information OR checking out that cute dress you’re showing me a listing for, I’m probably going to go check out the dress. And then I might not come back. Remember the goal of your page and then remove all elements that do not match that goal. Most people will do anything not to complete a purchase even if they want to complete it. Take away the distractions. 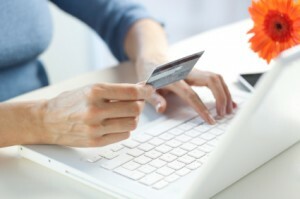 Your checkout process needs to be kept as simple, as streamlined and as intuitive as possible. This isn’t a place where you want people to think. It’s where they are to act like robots and hand over their payment information without stopping to smell the roses. The simpler your process, the more likely this will be the case. While following eCommerce best practices is a great way to get yourself 80 percent there, we’d always recommend performing your own usability testing to truly understand how customers are navigating through your site, where they’re getting caught up, and what roadblocks are stumping them that they may not even realize. At Outspoken Media, we’ve become fans of UserTesting.com to help us do this. There. Do you see how easy that is?